Carmen & Fernand Cortez (Luisi; Pretti) in Florence; Nabucco, Aida, Luisa Miller and I due Foscari in Parma; Giulio Cesare and Quartett in Milan. Our annual pilgrimage to the Verdi Festival in Parma is a trip to the soul of Italy, and also to the soul of Italian opera. In 2019, we enjoy a wide array of operatic styles in Parma, Florence and Milan, with four Verdi masterworks at the core of the tour. In Florence, we hear hear Bizet’s timeless Carmen, and Spontini’s rarely-performed Fernand Cortez under the baton of Fabio Luisi, the new Music Director of the Maggio Musicale Fiorentino. We also partake in some of the finest art, cuisine and wine to be had anywhere. Our hotel is the charming and perfectly-located L’Orologio. In Parma, we hear four superb Verdi works that span a 30-year period of matchless creative genius: Nabucco (1842), I due Foscari (1844), Luisa Miller (1849) and Aida (1871). 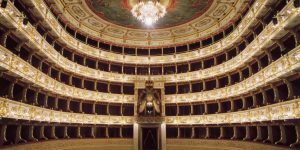 There are definitely many stranieri at the performances in Parma’s glorious Teatro Regio and Busseto’s miraculously tiny Teatro Verdi, but there are also locals, and although the peanut gallery at La Scala has the reputation, the Parmagiani are a tougher crowd. Yes, they can crush the spirit of a singer not yet ready for the big stage, but they can also warmly reward the deserving. Witnessing a performance at Teatro Regio is the ultimate Verdi experience—an orchestra and conductor with Verdi in their blood, singers born to sing the maestro’s lines, and an unforgettable electricity in the auditorium. This is a highlight in our year, every year. Our hotel is the 5-star Grand Hotel de la Ville. In Milan, the most fashionable (and wealthiest) city in Italy, we attend two performance at opera’s mecca, Teatro alla Scala: Handel’s Giulio Cesare starring the inimitable Cecilia Bartoli, and Luca Francesconi’s 2011 Quartett, featuring original interpreters Allison Cook and Robin Adams. We also enjoy a guided tour of the La Scala museum, which could suffice as a museum of opera itself. In addition, we explore the magnificent Duomo, visit Verdi’s final resting place at the Casa di Riposo and behold Leonardo’s The Last Supper at the Church of Santa Maria della Grazie. Our hotel here is one of our favourites anywhere–the Grand et de Milan, Verdi’s own city home until his death in 1901. Independent departures for overnight flights. Upon arrival in Florence (FLR), you are met and transferred to the Hotel L’Orologio, in the heart of the city. After settling into deluxe rooms, we meet and depart for a Welcome Dinner at Buca Mario. After breakfast (included each day of the tour), we meet our excellent guide and tour Florence, including Ponte Vecchio, Piazza Duomo and the Church of Santa Croce. Following an afternoon at leisure, we meet for an unforgettable dinner at Il Verrocchio at the Villa la Massa. Today we tour the highlights of the Uffizi, followed by a memorable lunch at Ora d’Aria. Those wishing to continue will tour the Pitti Palace and Boboli Gardens. This evening we hear Bizet’s Carmen at the Maggio Musicale Fiorentino. Today we visit the Medici Chapels, which celbrate the former Grand Dukes of Tuscany. We also visit the San Lorenzo Market and end with a visit to the Accademia solely to view Michelangelo’s awe-inspiring David. This evening we return to Teatro del Maggio for Gaspare Spontini’s rarely-performed Fernando Cortez, under the baton of Fabio Luisi. This morning we we depart for Parma, stopping in Bologna for a guided tour and lunch. Upon arrival in Parma, we check in at the Grand Hotel de la Ville, the only 5-star hotel in the city. This evening, we transfer to gorgeous Teatro Regio for a new production of Verdi’s powerful Nabucco. Enjoy the morning at leisure, exploring the streets, shops and cafe’s of Parma. This afternoon, we meet to explore Verdi sites, including the Villa Sant’Agata. Dinner is included at the superb Antica Corte Pallavicina. Afterward, we experience a production of Aida in the tiny 300-seat Teatro Verdi in Busseto. This morning we tour the highlights of Parma, including the Duomo (Correggio cupola), Baptistry (Antelami), the spectacular Teatro Farnese in the Pilotta Palace, followed by lunch at Corale Verdi. This evening we hear our third Verdi Festival performance, Luisa Miller. Following a morning and lunch at leisure, we meet for a reception with the Club of the 27 (Parma’s Verdi fan club extraordinaire) prior to a late-afternoon performance of I due Foscari at Teatro Regio. A private dinner reception follows at the opera house. We depart by coach for Milan (2 hours) and check in at the Grand Hotel et de Milan, one of our favourite hotels in the world and Verdi’s home when he was in the city. Time for lunch and exploring/shopping. We meet in the lobby for a cocktail reception (light meal) prior to a Robert Carsen production of Handel’s Giulio Cesare, starring Cecilia Bartoli. This morning we meet in the lobby and tour the Galleria Vittorio Emanuele II, the magnificent Duomo, the La Scala Museum and the Ricordi Music Archive. Following an afternoon at leisure, we return to La Scala for a performance of Luca Francesconi’s short work Quartett. Dinner is included afterward at Arengario. Today we visit the Sforza Castle, with a stunning collection of works by Da Vinci, Mantegna, Michelangelo and more. We then behold Da Vinci’s The Last Supper at Santa Maria delle Grazie, ending with a private visit at the Casa di Riposo, the final resting place of Giuseppe Verdi. This evening, our Farewell Dinner is at Il Salumaio. Transfers for departing flights are included. Flights are not included, and we regret that we cannot assist with flight bookings. Ideally, your flights should be booked to arrive in Florence (FLR) early afternoon on October 13, with departure from Milan (MXP or LIN) on the morning of October 24.